Developer TMS Software released an update for their nice Cloud Services component suite for Delphi Berlin and FireMonkey with two new additions: TTMSFMXCloudMSComputerVision and TTMSFMXCloudMSBingSpeech. Among the other Cloud Services, the developer can access Google Services (Calendar, Contacts, Drive, Mail, Photos etc. ), Social media services (Facebook, Twitter, LinkedIn, YouTube etc.) and payment services (PayPal). The TTMSFMXCloudMSComputerVision uses Microsoft Computer Vision powerful algorithms to analyze information about the visual content found in an image. You can categorize and analyze many types of images starting with facial recognition, reading text in images, license plate recognition to even real time video analysis and much more. The TTMSFMXCloudMSBingSpeech helps you speech read a text, which is a very useful feature for visual impaired people and in combination with image content analysis to offer them a real image of the world. The implementation of these two components is straightforward and it takes less than 15 minutes. Use TTask component to avoid blocking the main application thread. In order to use them in your applications, you have to register to with Microsoft Cognitive Services in order to get an Api key. If you use the free plan, Microsoft offers you 5,000 transactions per month. If you require more for your business, choose the standard paid plan. You should be able to use these components across Android, IOS, OSX, and Windows. The components are licensed and you have to buy them in order to use them in your applications, single license being the most convenient option. If you want to first test the performance and results, free demos are provided and you can download them. 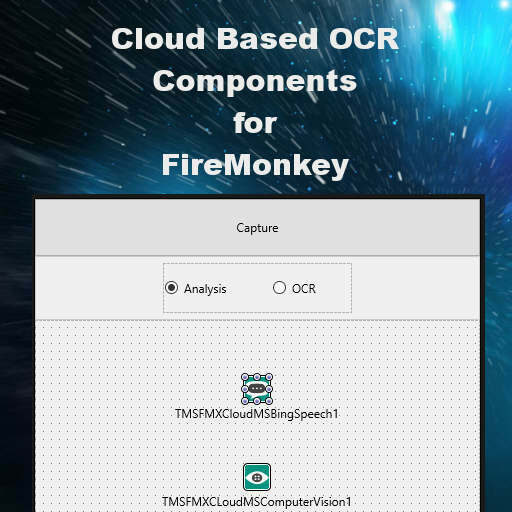 Head over and check out the free trial and demos for TMS FMX Cloud Pack for Delphi 10 Berlin and Firemonkey.